When Prince George had his New Zealand playdate on 9 April his romper suit with sailboat smocked on the front, inspired parents to rush out and buy up the outfit by British designer Rachel Riley. Like many royals before his clothing both inspires and reflects the fashions of the time. A baby’s ‘first shirt’ in Te Papa’s collection, thought to have been worn by King George III when he was born in 1738, provides the opportunity to reflect on 18th century babywear. 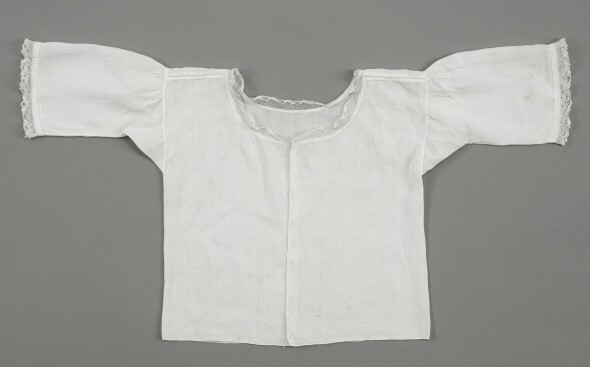 During the 1700s a simple shirt like this was a baby’s first item of clothing, worn next to the skin. As was typical of the time it is made of fine linen with a front opening, hand-stitched shoulder seams and inset sleeves. A fashionable detail was often added, Te Papa’s shirt has lace applied round the neck edge and sleeves. When the shirt was gifted to the museum, family history recalled that it was acquired by Thomas Wilkinson, an upholsterer who worked for King William IV, the third son of King George III. Sadly the first shirt doesn’t have a monogram embroidered on it, which would have confirmed it’s association with baby George III. The application of a monogram to undergarments was the usual practice by Queen Victoria’s era but may not have always been the case in the 1700s. New born babies in the 1700s tended to be dressed uniformly in a first shirt, a nappy or clout (as it was called then), a bib, a cap and swaddle bands which were wound round the child’s body. This way of clothing new-born babies was practiced for many centuries – 14th century sculptures and manuscript illustrations provide some of the earliest evidence of the practice. Young boys wore dresses up until the age of about six or seven, and older children wore clothing which mimicked that of adults. 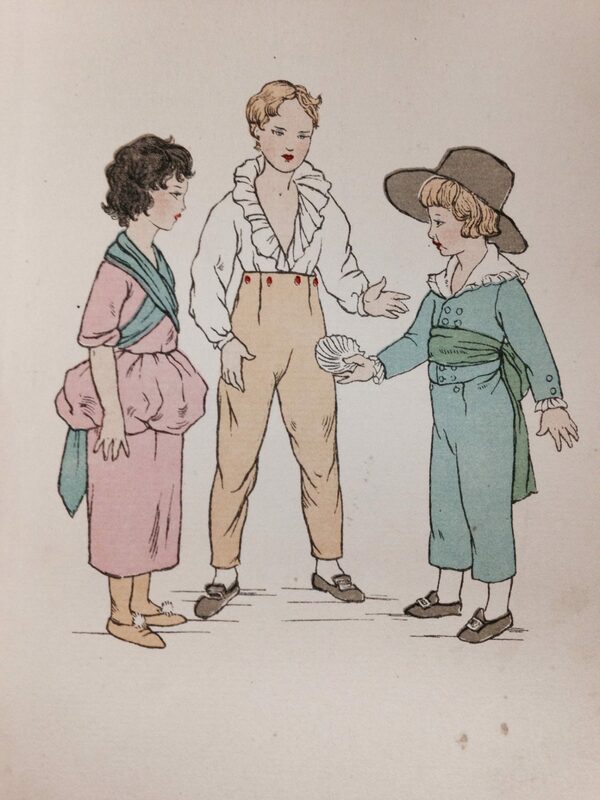 Prior to the 1770s children’s clothing was very formal and no allowance was made for play. It wasn’t until about 1775 that clothing specifically designed for children was created. Illustration of children’s clothing, 1775 in English Children’s Costume (1935) by Iris Brooke. Perhaps one of the most significant royal contributions to children’s fashion was the sailor suit. When Queen Victoria’s eldest son, Prince Albert Edward wore a sailor suit on a royal visit to Ireland in 1846 it sparked a fashion trend that continues today. Prince Albert’s suit was a miniature version of the uniform worn by sailors on the royal yacht but many variations were created. Te Papa has two examples from the 1800s in its collection. As the New Zealand leg of the royal tour comes to an end and the young family prepare to leave our shores, it is an opportune moment to reflect on the future and question what influence Prince George will have on our lives. At least in the first instance, dressed in his nautical inspired outfit, he is proving to be a global fashion trend-setter.